What is the IPMT Function? The IPMT function is categorized under Financial functionsFunctionsList of the most important Excel functions for financial analysts. This cheat sheet covers 100s of functions that are critical to know as an Excel analyst. The function calculates the interest portion based on given loan payment and payment period. We can calculate using IPMT the principal amount of payment for the first period, last period or any period in between. As a financial analystFinancial Analyst Job DescriptionSee a real Financial Analyst Job Description including all the skills, experience, and education required to be the successful candidate for the job. Perform financial forecasting, reporting, and operational metrics tracking, analyze financial data, create financial models, we will often be interested in knowing the principal component and interest component of a loan payment for a specific period. IPMT helps to calculate the amount. Rate (required argument) – It is the interest per period. Per (required argument) – It is the period for which we want to find the interest and must be in the range 1 to nper. Pv (required argument) – It is the present value, or it is the lump sum amount that a series of future payments is worth as of now. Fv (optional argument) – It is the future value or a cash balance that we wish to attain after the last payment is made. If we omit the Fv argument, the function assumes it to be zero. The future value of a loan would be taken as zero. Type (optional argument) – It accepts the numbers 0 to 1 and indicates when payments are due. If omitted, it is assumed to be 0. Set type to 0 if payments are at the end of the period, and to 1 if payments are due at the start. 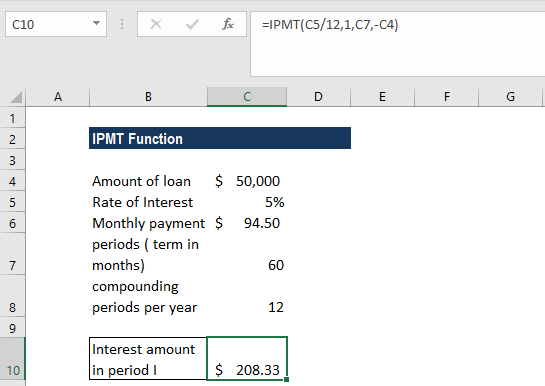 How to use the IPMT Function in Excel? 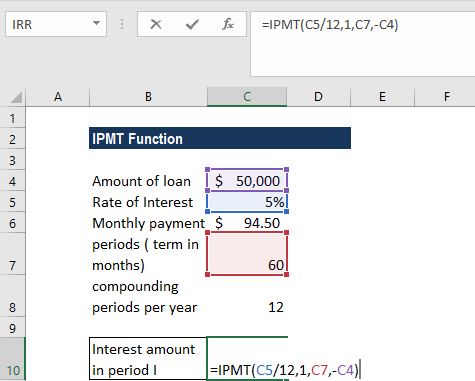 As a worksheet function, IPMT can be entered as part of a formula in a cell of a worksheet. 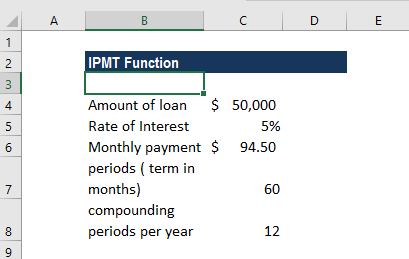 We will use the IPMT function to calculate the interest payments during months 1 and 2 of a $50,000 loan, which is to be paid off in full after 5 years. Interest is charged at a rate of 5% per year and the payment of the loan is to be made at the end of each month. The formula to be used will be =IPMT( 5%/12, 1, 60, 50000). As the payments are made monthly, it was necessary to convert the annual interest rate of 5% into a monthly rate (=5%/12), and the number of periods from years to months (=5*12). With the forecast value = 0 and the payment is to be made at the end of the month, the [fv] and [type] arguments can be omitted from the above functions. The returned interest payments are negative values, as these represent outgoing payments (for the business taking out the loan), that is why we took the loan amount as negative (-B2). We need to ensure that the units we use for specifying the rate and nper arguments. If we make monthly payments on a 4-year loan at 24% annual interest, we need to use 24%/12 for rate and 4*24 for nper. If you make annual payments on the same loan, use 24% for rate and 4 for nper. Cash paid out is shown as negative numbers. Cash received is shown as positive numbers. #NUM! error – Occurs if the supplied per argument is less than zero or is greater than the supplied value of nper. #VALUE! error – Occurs when any of the given arguments are non-numeric.